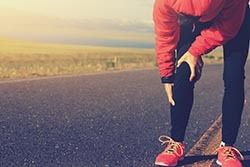 Pain in the leg can occur from running. Any discomfort in the leg area is leg pain. It could materialize in the upper leg, lower leg or knee area. There can be many causes that lead to pain in the leg. Repeated physical activity can cause tendonitis of the knee. A blow or an awkward fall can cause a strain or sprain of the knee. Other types of pain in the leg include muscle cramps. This can happen due to dehydration during intense physical activity. Leg cramps are common for athletes as they approach the end of a game or training session. Pain in the leg also include shin splints, which is the result of inflammation near the shin bone. Conditions such as thigh or quad strains/sprains also cause pain in the leg. The most common symptom will be an uncomfortable or intense feeling present in any part of the leg. Depending on the condition, this may occur in and around the knee, in the upper leg or in the lower leg. The only way to understand why a patient is experiencing leg pain is to seek a sports medicine doctor. Dr. Bob Meyer at the Spinal Rehab and Sports Medicine clinic can help a patient can get to the bottom of their pain. Dr. Meyer has extensive experience helping athletes recover from sports injuries. He will perform tests, diagnose the condition and recommend the best course of sports injury treatment. Most treatments begin with the RICE treatment. This includes rest, ice, compression and elevation of the injured area. Sports medicine can then help heal the injury trough stretches, exercises and technology. Surgery may be a last resort for intense pain that is the result of a serious muscle, ligament or bone injury.